These little pots of meaty goodness promise to make right in the world. 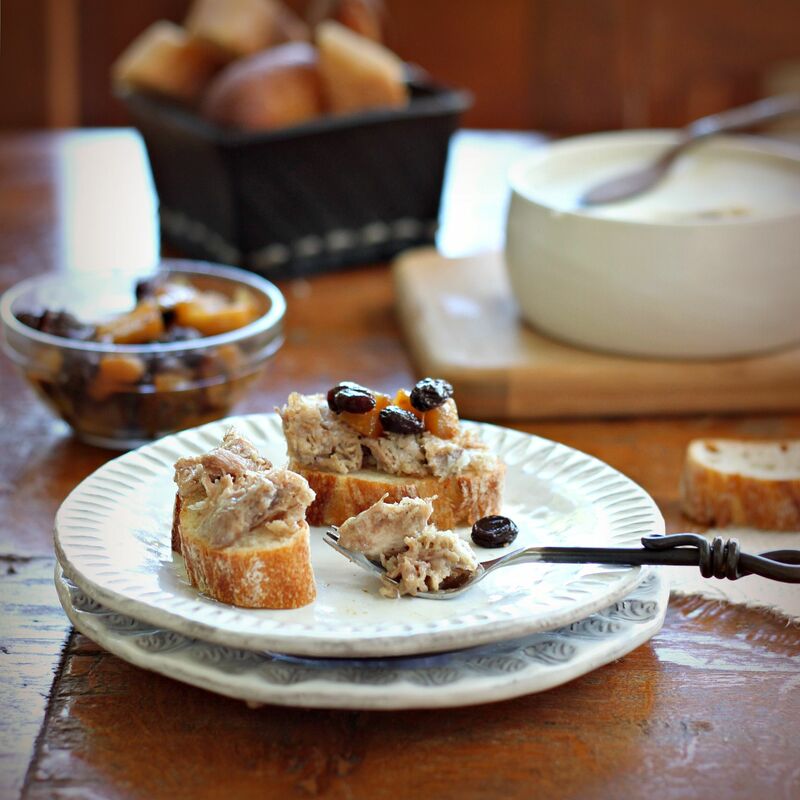 Rillettes are potted jars and terrines of meat confit, slow cooked in fat, shredded and packed in more fat. Rustic, unctuous and oh-so-rich, a little dab goes a long way. Which is why the process of making rillettes is called “stretching,” which is this month’s Charcutepalooza challenge. Stretching is an economical and sparing way of making meat last – using all of the last bits and preserving them for later use. It’s a method steeped in conservation and frugality, yet its results are rich and luxurious. It’s the paradox of French country cooking, and it’s why I love it. 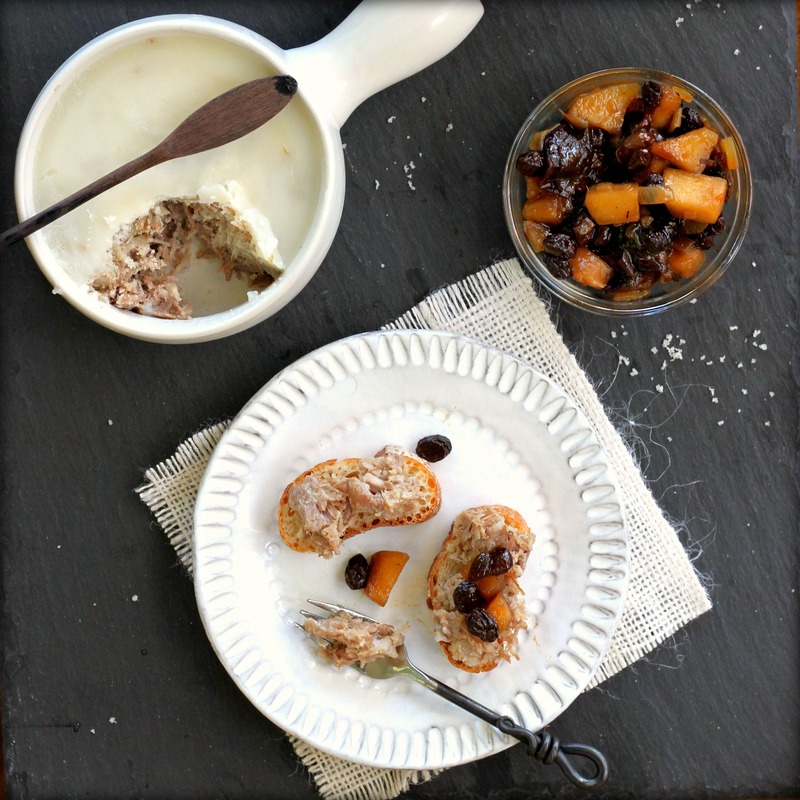 Duck, goose and pork are traditional proteins for rillettes. I chose pork and adapted a recipe from WrightFood where the pork is spiced and marinated overnight in Calvados, then slowly cooked in duck fat. Need I say more? I like to accompany rillettes with fruit chutney. The sweet piquancy of chutney adds a fresh balance to the rich meat. Chutneys are flexible and forgiving. Use a mix of fresh and dried fruit, combined with an acid, such as vinegar or citrus. Sweet and savory with a kick, chutneys are perfect accompaniments to meat and poultry. An inspirational idea hatched by Cathy Barrow and Kim Foster and partnering with Food52 and Punk Domestics. It celebrates a Year in Meat, where participating foodies and bloggers will cure, smoke and salt their way through Michael Ruhlman’s bestselling cookbook Charcuterie. Just fantastic! Both the rillettes and the chutney must taste out of this world. That looks so sumptuous. Beautifully done, as always! Gorgeous rillettes and the chutney is lovely. 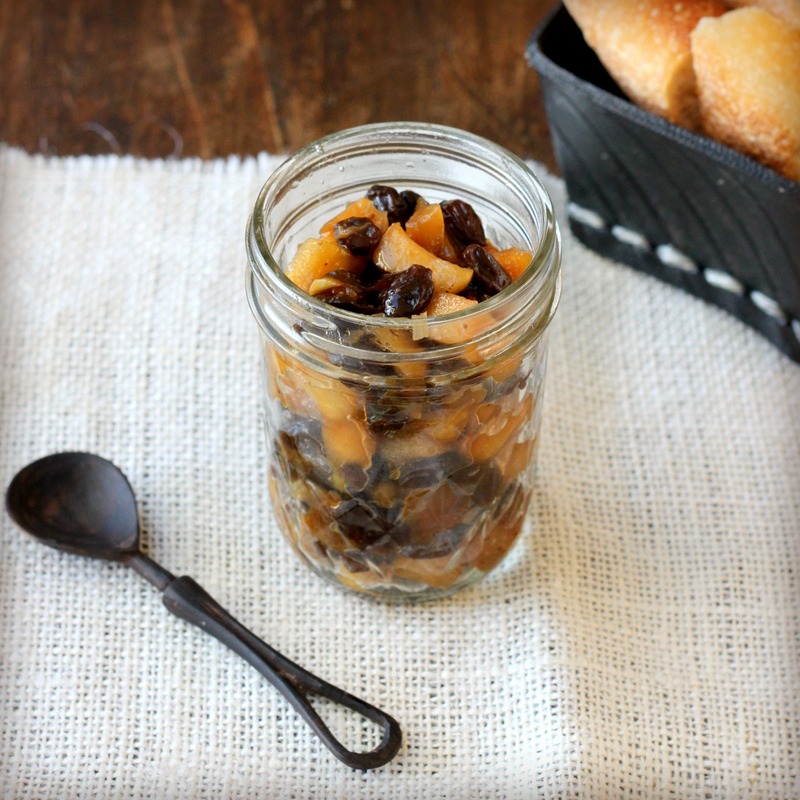 I don’t know why I’ve never put a prune in chutney – it’s a fantastic idea. This is the sort of food I love; made over a longer period of time, requiring patience, technique and balance. The results of good rillettes are always amazing and I love the sound of all the flavours added – the juniper and the calvados. I could the photos right off the page! Lovely recipe and I can just imagine how nicely it would go with pork rillettes! Heaven in the mouth! your post brought nice memories, and of course the chutney goes perfectly with the pork, Calvados combo. I don’t think I’ve ever heard of rillettes before. They sound like a delicious snack though and I like the use of chutney with it. Damn…another month’s challenge missed for me. Nice to see you have remained resolute and added to your considerable Charcutepalooza successes. Another beauty, Lynda. A very beautifully presented appetizer. I love prunes, and I’m sure they would be delicious with apples! The juniper berries are an interesting addition. This food looks so gorgeous..apple chutney on top of crusty bread = bliss! Pingback: Charcutepalooza. Today we announce the ten semifinalists for the grand prize. What a year it’s been. Wow… I’ve been searching for dishes with calvados and stumbled upon this beauty!